ecfirst’s bizSHIELDtm program satisfies this HIPAA requirement. ecfirst’s bizSHIELDtm program satisfies this HITECH requirement. Hospitals, health systems, physician practices, payers such as insurance organizations, as well as business associates must conduct a comprehensive risk analysis exercise to meet HIPAA mandates, including HITECH Meaningful Use requirements for Stage 1. Have you completed a risk analysis exercise recently? ecfirst, Home of The HIPAA Academy™, can address this mandate now. ecfirst developed the bizSHIELDtm program to assist Covered Entities, Business Associates, and vendors of Electronic Health Records (EHRs) and Personal Health Records (PHRs) in meeting the requirements of the HIPAA Privacy and Security Rule, The HITECH Act, and all subsequent guidance documentation and settlement agreements. As a part of the bizSHIELDtm program, ecfirst will list every requirement of the HIPAA Security Rule including every Safeguard, Standard, and Implementation Specification in a risk analysis format that identifies an organization’s state of compliance with the requirement, recommended remediation activity, and associated risk priority. All remediation activities will be listed according to recommended implementation time bands in the bizSHIELDtm Corrective Action Plan (CAP) table. The bizSHIELDtm report is an actionable, documented risk analysis that provides both in depth and executive summary level findings appropriate to all audiences from administrators to the Board of Directors. bizSHIELDtm helps an organization to understand, improve, or verify their compliance with the HIPAA Privacy Rule. bizSHIELDtm provides both summary and detailed compliance information as well as all necessary remediation activities pertinent to the organization’s business model. bizSHIELDtm will enable an organization to quickly determine the state of compliance, needed remediation, and will list actionable steps to achieve compliance. Under the HITECH Data Breach Rule, organizations are required to take steps to prevent, identify, report, and remediate data breaches of unsecured information. The ecfirst TRACER solution will document the ability of the organization to detect a breach, review the incident management policy and procedures, and make recommendations. In addition, organizations will receive a HITECH Data Breach policy and several Data Breach procedures to ensure compliance, should a breach happen. Contingency planning, also referred to as Business Continuity Planning (BCP), is a coordinated strategy that involves plans, procedures and technical measures to enable the recovery of systems, operations, and data after a disruption. A Business Impact Analysis (BIA) is the foundation for building Contingency Plans. Once the BIA is completed, Contingency Plans can be developed using the information identified in the BIA. Typically, two types of Contingency Plans will need to be developed. Emergency Mode Plans for business unit recovery and Disaster Recovery Plans (DRP) for Information Technology (IT) systems and infrastructures. Contingency plan is a HIPAA Security standard. The objective of the contingency plan standard is to establish (and implement as needed) policies and procedures for responding to an emergency or other occurrence (for example, fire, vandalism, system failure, and natural disaster) that damages systems that contain EPHI. As shown in bold in the Figure below, the Contingency Plan standard is defined within the Administrative Safeguards section of the HIPAA Security Rule. Contingency plan related requirements are also identified as implementation specifications in the Physical Safeguards section of the HIPAA Rule as well as the Technical Safeguards section. 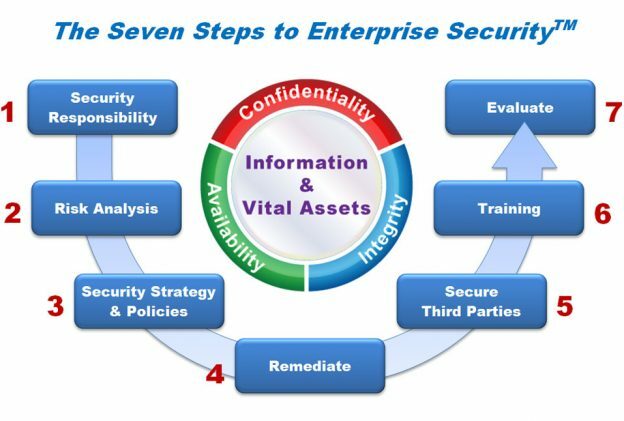 The Seven Steps to Enterprise Security™ is a methodology that describes a road-map to safeguard sensitive business information and enterprise vital assets. This methodology is also referred to as bizSHIELDtm. bizSHIELDtm has also been influenced by the clauses (domains) defined in the ISO 27002 security standards as well as the CobIT and NIST security frameworks. The bizSHIELDtm methodology delivers Confidentiality, Integrity and Availability (CIA) of your vital information and business assets. This methodology provides the blueprint for defending today’s enterprise. The Seven Steps methodology provides the framework for addressing contingency requirements. The bizSHIELDtm security methodology identifies seven critical steps for an organization to follow as a twelve-month framework for organizing and prioritizing enterprise security initiatives. ecfirst only engages credentialed professionals for its BIA engagements. Credentials such as CISSP, CSCS™ and CBCP are typical of ecfirst teams assigned to client engagements. Interviews with key members of IT staff, key individuals in departments and management. Copies of IT system and network documentation including downtime procedures and inventory of vital assets such as servers and applications. Fixed Fee with a Monthly Payment Schedule: Call for details and a customized proposal exclusively for your organization. On-Demand Compliance Solutions from ecfirst provides your organization with access to specialized compliance and security skills with no short term or long term commitments. Get Started Today! For a complimentary private Webcast on Contingency Planning & BIA, please contact John Schelewitz at +1 480.663.3225 or John.Schelewitz@ecfirst.com. Hospitals, health systems, physician practices, payers such as insurance organizations, as well as business associates must conduct a comprehensive technical vulnerability assessment exercise to meet HIPAA mandates, including HITECH Meaningful Use requirements for Stage1. Have you completed a technical vulnerability assessment exercise recently? ecfirst, Home of The HIPAA Academy™, can address this mandate now. A key requirement of the HIPAA and HITECH regulations is that covered entities and business associates must conduct a comprehensive and thorough assessment of the potentials risks and vulnerabilities to the Confidentiality, Integrity, and Availability (CIA) of all electronic Protected Health Information (EPHI). These HIPAA and HITECH mandates require that organizations must complete a comprehensive and thorough vulnerability assessment on a regular schedule. The Office of Civil Rights (OCR) wants to ensure that organizations have identified all of the risks and vulnerabilities to the EPHI that they collect, store, process, or transmit. The ecfirst bizSHIELDtm risk analysis program includes a technical vulnerability assessment to address HIPAA and HITECH mandates with the objective of establishing and prioritizing compliance and security gaps. When was the last time your organization conducted a risk analysis activity that included a technical vulnerability assessment? ecfirst will identify vulnerabilities within client’s Internet-facing infrastructure, and attached network systems. The ecfirst testing will analyze client externally accessible servers. Additional IP addresses can be assessed as required. ecfirst will perform an internal network vulnerability assessment on client internal network infrastructure. This testing will verify that the security controls implemented on a sample set of five (5) selected hosts, including servers located in the IT Data Center or desktop PC images and provide an adequate level of protection against network attacks. Rulebase configuration is critical to the integrity and operating security of a firewall. The rulebase should be tied to business requirements. Every rule that is configured on a firewall is essentially a permissible security hole into the company’s network infrastructure. Each of these rules should have a well defined business need for existing. However, many corporations open rules for testing and never close them when the test has completed. Additionally, many rules are opened up because of then-current business needs, but never closed or repaired once that need, or the corresponding business contract, has ended. This results in legacy access and a vulnerability providing a pathway into the internal network. Wireless networks are particularly vulnerable to attacks because it is extremely difficult to prevent physical access to them. The only advantage they have in this respect is that an attacker must be in relative physical proximity to the network, which can limit the pool of potential attackers. However, with the price of high gain antennas being extremely small, attackers can strike from much further distances with affordable ease. To secure a wireless network, an administrator should know what types of vulnerabilities exist and what types of attacks can exploit them. Organizations with excellent security programs often spend large amounts of money on capital purchases to implement technical security controls. However, employees or contractors of the entity often prove to be the weak link in the security chain. Employee and contractor education is a key component to any information security program. Authorized members of the workforce have both authenticated access to information systems as well as physical access to facilities and secured areas. During the social engineering assessment, ecfirst will attempt to gain unauthorized or inappropriate access to facilities, secured areas, documents, credentials, or confidential data. ecfirst security personnel will attempt to bypass security controls that are in-place in order to gain access to various assets. ecfirst will attempt to bypass electronic, personnel, and procedural controls during this assessment. ecfirst will document and present a very detailed record of successes, failures, controls bypassed, access achieved and information obtained during the assessment. The ecfirst Express Penetration Test is less comprehensive than the full Penetration Test in scope as it only addresses external and internal technical vulnerabilities & threats; physical and personnel vulnerabilities and threats are not evaluated. A detailed technical Corrective Action Plan (CAP) is included in the bizSHIELDtm report to provide actionable directives for addressing the identified deficiencies. You Can Do It, We Can Help! Starting with a commitment of 40-hours or more, you can secure IT professional resources with experience in the healthcare industry across a broad range of skill sets. So be with project management, security professionals, compliance professionals, system analysts, network engineers or more, talk to ecfirst about your requirements and how we can help with staffing or collaborating with you on your project initiatives under our management with your objectives. We Get It Done! The Managed Compliance Services Program (MCSP) is the industry’s most unique and flexible managed services program. With the MCSP you decide what combination of services you contract with ecfirst to manage, and you determine the duration – one year, two years, three years or five years. The duration of the contract determines the flat rate discount you secure for the length of the contract. And, to top it, payments are monthly for the duration of the contract, with absolutely no interest, and nothing due upfront! So you decide what service components are to be delivered by ecfirst in what timeframe. It’s amazingly, simple! For example, are your internal resources stretched to capacity and you lack the necessary expertise to identify all compliance gaps and security vulnerabilities? Does your organization need to comply with regulations and standards such as the HITECH Act, State Regulations, HIPAA Privacy and HIPAA Security? In Depth resource capabilities with trusted knowledge of legislation and client infrastructure. This chart summarizes key areas addressed by the ecfirst MCSP. The MCSP is designed to address your compliance, security and other technology implementation, support and management challenges. This program enables your organization to both lower costs and save time. The MCSP is a highly flexible and scalable service. The MCSP provides a complete, end to end compliance service offering that can be tailored to meet your specific requirements.